As an avid senior citizen fisherman, I have been fortunate to fish in 36 different states, so far. I also am a vendor at numerous RV rallies etc and I have talked with hundreds of RVers that would love to fish as they travel. The hassle and cost has discouraged them. Quite often the subject of a senior license comes up and everyone seems to favor a system to provide it. When I heard about the National Senior License concept, I joined in to help its promotion. Please sign the petition and email it to Passport-America or send to Passport America in Long Beach, Mississippi. participating state, a Senior citizen attaining the age of 62, may purchase an annual universal fishing license which grants fishing privileges in participating states. The Senior citizen must also possess a valid fishing license and any required trout stamps or special “usage fee endorsements or stamps”, etc. from his or her home state. 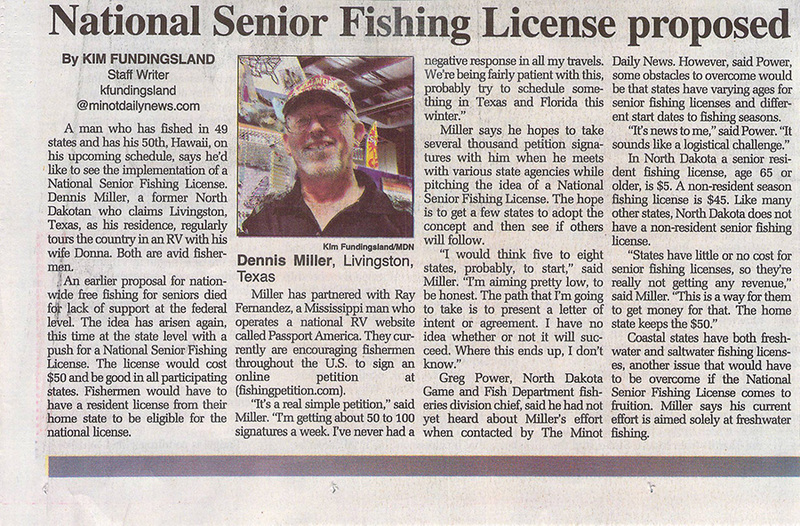 National Senior Fishing License Covered in ND Newspaper!